How big is England compared to Texas? Where is Dallas? Is it a Good City to Live in? Was Texas ever an independent country? What are the popular places to visit in Houston? Water adds so much beauty and tranquility to landscape. 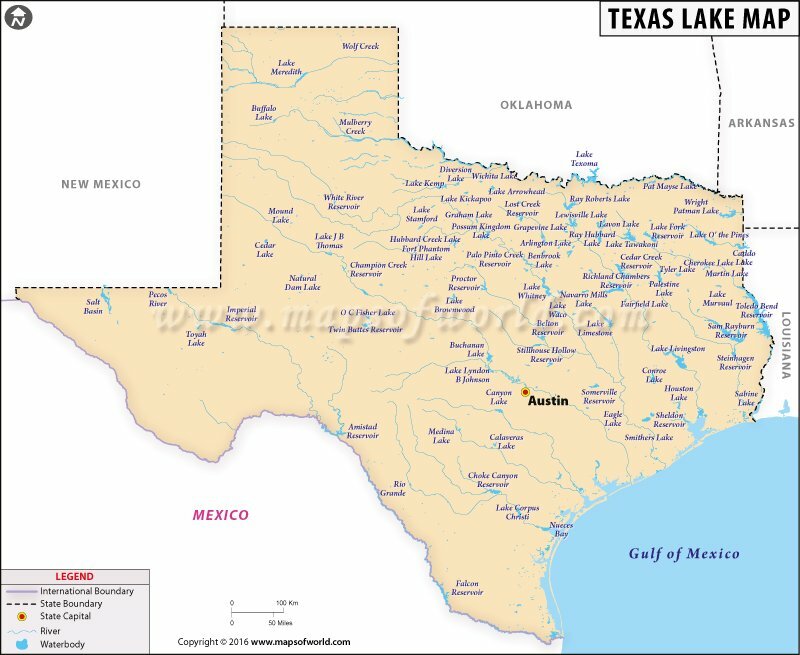 With more than 150 scattered lakes, Texas has a lot of destinations to have some fun in the sun and kickback with family & friends. Caddo Lake, on the border between Texas and Louisiana, features one of the largest flooded cypress forests in the US. The lake is a Ramsar Wetland due to a variety of flora & fauna. Visitors can glide down a canoe or kayak through cypress trees rising over the labyrinth of bayous. Lake Travis, northwest of Austin, furnishes for outdoor recreation including fishing, boating, swimming, and camping. Lady Bird Lake, which is two hoots and a holler away from downtown Austin, remains a popular recreational area among city-dwellers for kayaking, canoeing, and dragon boating. Beautiful waterfront parks and trails along the lake add to the charm. With a surface area of over 23,500 acres, Lake Whitney is a year-round spot for Texas residents to enjoy water sports such as fishing, sailing, jet skiing, and water skiing. Places to camp, luxury lodgings, and hotel amenities are on offer around Lake Fork Reservoir. Lake Whitney, a reservoir on the Brazos River, is an ideal destination to spend a weekend in private cabins. Covering an area of nearly 10,000 acres, Green Lake in Calhoun County is the largest natural freshwater lake located entirely in Texas. Clear Lake, which feeds Galveston Bay, is a major recreation center among anglers and boaters. Lewisville Lake is a water source for Dallas and its suburbs as well as a place to have quality time with family. Public boat rides and jet skis rentals are on offer during the summer months. Lake Fork Reservoir, near suburban Dallas, is best known for one of the premier trophy bass fishing destinations in the country. Lake Bob Sandlin State Park in the Pineywoods is famous for pier fishing and boating. Amistad Reservoir, along the Mexican border, features a wide variety of plant and animal life.